Here's a morsel of good news for consumers looking for credit cards: Rates offered to the overall consumer market fell slightly to 16.74%, down from 16.78% from the April 30 Credit Card Monitor. The drop stemmed from changes in non-reward consumer credit cards, which saw rates decline to 15.36% from 15.51%. Rates for rewards consumer credit cards--which tend to be higher than for non-rewards cards--remained stable at 17.33%. Student credit card and business credit card rates also stayed the same. The best news was for consumers with excellent credit. The average rate offered to this market on non-rewards credit cards dropped to 10.79% from 11.09%, a sizable decline in two weeks. The average rate for excellent-credit consumers for rewards cards stayed the same at 13.52%. Many credit card offers include tiered rates according to consumers' credit histories. Those with the best credit scores get the lowest rates, while consumers with poor credit are offered the highest rates, which often top 19%. Therefore, consumers with good credit typically can find deals that are better than the average rate, and consumers with sketchy credit usually have to pay higher-than-average rates. 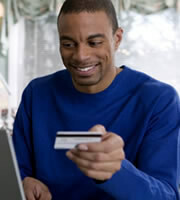 To determine a single "average" rate, IndexCreditCards.com includes all the various rate tiers that card issuers offer. Some rate tiers vary by as much as 10 percentage points for the same credit cards. The stabilization of credit card rates sharply contrasts to the market last year when issuers scrambled to hike interest rates in anticipation of sweeping changes from credit card reform. Average rates for the overall consumer market broke the 16% mark for the first time in December 2009. The Credit CARD Act, signed into law one year ago, ushered in a host of new rules, the bulk of which went into effect in February of this year. Among them was a ban on rate hikes on existing balances unless cardholders are more than 60 days behind on payments. Card issuers also must apply payments above the monthly minimum to the highest-rate balances first--a reversal of common credit card company practices. These and other new rules threatened to cut into credit card company revenue, prompting issuers to jack up rates across the board. Financial mavens are closely watching the business credit card market, meanwhile, which is not subject to the new consumer regulations. Business credit card rates inched up earlier this year but have remained relatively stable since the new regulations went into effect. In fact, our survey last month showed that rates for non-reward business cards declined slightly. Credit card rates play a significant role in the financial welfare of small businesses because conventional bank lending remains tight. It's also unclear how the new credit card rules will impact long-term rates for college students, who now have to get co-signers if they're under 21 and can't prove they have enough income to pay for their credit card bills. Rates for students were on the rise earlier this year but tapered off in the last six weeks. 0 Responses to "Average Credit Card Rates slip slightly"